While this isn’t billed as a hot pot, it certainly does that job – and more. Like many pots designed for Mongolian Hot Pot, it includes a grill plate for added versatility. The pot holds 3 quarts and the grill plate is 10 inches in diameter, so you can use this for cooking for a crowd. Besides using it to simmer liquids, cook noodles, or grill meats and vegetables, this super-versatile pot can be used for slow cooking, stir-frying, warming food, making fondue, and steaming. Cleanup is easy, since all of the non-electric parts are dishwasher safe. This operates with a dial to set the temperature up to 450 degrees. The removable cooking pot is made from cast aluminum and has a nonstick surface, and it has a pouring spout for transferring soups or liquids. This includes a tempered glass lid and a removable temperature control probe. If you’re looking for a simple hot pot at a budget price, this one has plenty of features and a modest price tag. It has seven heat settings so you can cook a variety of foods, and it can boil water quickly and easily. Measurement marks inside the pot allow you to measure water for instant soups, and an easy-pour spill-proof spout lets you pour your soup into a mug without making a mess. This has a non-stick interior for easy cleaning, and the lid is removable and dishwasher safe. The handle stays cool during cooking, so you can pour hot liquids safely. For added versatility, this includes an egg rack that holds up to six eggs, and a steamer rack. While this isn’t the prettiest appliance you’ll find, it’s great for cooking and heating foods at home, at work, in the dorm, or while traveling. This multi-use pot can be used for simmering, steaming, making Mongolian hot pot or shabu-shabu, and for grilling. It has a 3-quart stainless steel pot, a 1.5-quart grill pan, and a see-through tempered glass lid. It also includes a steam rack and mesh strainer for even more versatility. This has a dial for controlling temperature, and an indicator light to show that the pot is working. The handles are designed to stay cool during cooking. The downside of this pot is that instructions are minimal, so it might take some experimenting to figure out how to use the pot. While other hot pots allow pouring from the container, the design of this one means you’d need to scoop or ladle the food out of the pot. While this is called a skillet, it works perfectly for making Mongolian hot pot, for cooking noodles, for steaming, and more. 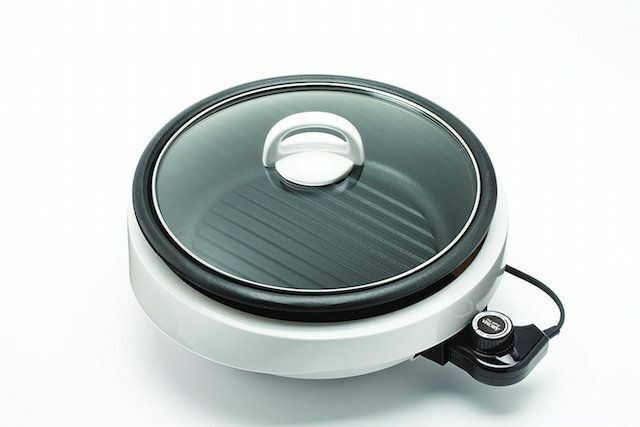 It comes with a deep pan for soups, fondue and broth as well as a titanium-ceramic coated nonstick flat plate for grilling or frying. There is also a special vented steaming accessory for steaming vegetables, buns, seafood, and more. The lid is made from tempered glass so you can check the cooking process easily. The temperature is controllable from 176-480 degrees, so it’s suitable for keeping foods warm, for boiling liquids, or for grilling. The power cord is detachable. The deep dish can also be used directly on the stovetop for added versatility and the cooker is easy to disassemble for easy cleaning. 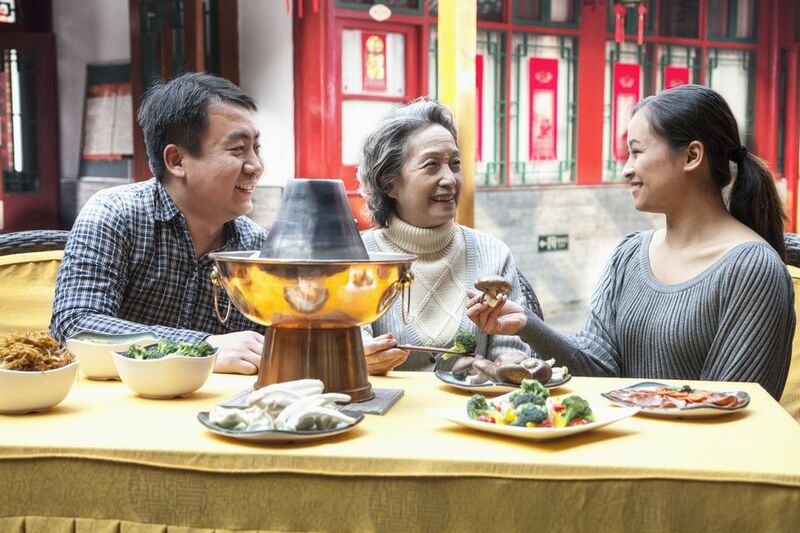 If portability is important, this hot pot can untether you. The cord unplugs from the unit, so you can pour at the table without the cord dangling or getting in the way. The simple dial sets the temperature and a light indicates that the kettle is heating. It’s designed with a wide top opening that make it easy to fill and to add ingredients without making a mess. The interior is stainless steel so it won’t stain and you can use metal utensils with no worry. However, the cooking pot is not removable, so this must be washed by hand. Since there is no nonstick coating, it might require some scrubbing. For easy cooking and eating on the go, an integrated mini spoon and fork are included that fit into the handle for storage and transport. This is great for a single serving or a little more, since it holds just 0.8 quart. Best for Grilling: 4.2-Qt. Electric Hot Pot with BBQ Grill by City ST. This two-in-one hot pot lets you make shabu shabu in the hot pot while grilling shrimp on the top grilling platform. Two switches make it easy to control the grill and cooking vessel. The inner pot and the barbecue plate are removable for cleaning, and it’s simple to assemble again for cooking. This should be hand washed.